Some say the key to a successful operation is just having a good product while others expect that a well-hyped and deliciously packaged product is the goal. And while I do know a couple places that do thrive on just one of those criteria, obviously a business that masters both is going places. In my opinion, Gimme! Coffee must be the Northeast poster child of such dual success. I've seen more plugs/ads/publicity for Gimme! coffee (they roast their own) and espresso (apparently they have some strong mastery) then any other nearby operation, and for seemingly good reason as I've heard nothing but positive things from lots of credible sources. The only negative thing I read was that they really like to roast dark, which could be good (if they know what they're doing) or bad (if they purvey nothing but charred oiliness). Obviously hearing so many pleasant things about a place so relatively close (in NYC area as well as Ithaca), I made it a point to stop by the first chance I was near a location. Ironically, the first time I was near Ithaca, I hit a closed sign by a mere 8 minutes (drat was I disappointed) but a month or so later, I made a day trip to Ithaca plenty early so to make a day of the town (Ithaca is gorges!). The first store I made it to was State St, a location tucked into a block of various small Ithaca businesses with an all but too quaint, flat brick face. The outside had some exterior seating with a very inviting appearance complimented with a very warm (orangy-red!) interior filled with patrons. The only odd thing about the inside was the overwhelming smell of celery or minestrone (it lingered in my nostrils like an angry hornet). The coffee was a stellar brew (I believe it was a Bolivian) with a beautifully smooth body and a floral accent. The espresso held a full, chocolaty sweetness and was pulled wonderfully. The tea is Harney and Sons, a tea I've found all too wonderful at other establishments. The other store was their Cayuga St location, seemingly placed on a very random corner near what appeared to be a canal or irrigation channel and some local residences (what a nice place to live). The outside was a beautiful store front with large windows and exterior seating, while the inside was a high-ceilinged narrow store with the counter smack in the middle of the place with seating orbiting around it. This place was also packed. The coffee, espresso, and tea here were of similar superb quality with some talented baristas working the machines. I must say that my visit to the Gimme locations lived up to the hype, as they were extremely professional in their performance and product. But as they are a roaster and purvey to various establishments, I've also had some truly poor Gimme roasts from other vendors (some really really dark coffee that I don't think was meant to be brewed) but what can you do? 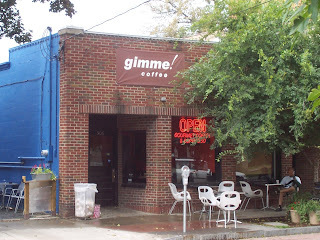 Make a point to give a visit to one of the Gimme locations in either Ithaca, Trumansburg, or the NYC area (I do believe there's a Manhattan location forthcoming on top of their Brooklyn establishment, but I could be misquoted). Visited the new Mott St Manhattan location. While a very small space, the coffee and espresso still hold to the same quality. Make sure to give it a stop.